Allan has been playing drums since the age of 9 in which he studied with the acclaimed Steve Palmer, one of Birmingham’s most prolific session drummers who worked at Ronnie Scott’s. Allan has played on large stages since the age of 12 and become a big fan of all rock drummers in bands such like Queen, Toto and Genesis. 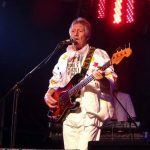 Over the years Allan has worked with many prolific musicians in the Midlands area. More recently Allan now sessions for bands or artists along with playing in Successful Tribute bands in both the UK and across Europe. He was very aware of Supreme Queen and jumped at the chance of working with them and reproducing the authenticity of Queen’s music through his playing and performance. Allan is endorsed by and uses London Drumstick Co. & Code drum heads. Loves: Playing drums live, His wife and children, music and sport. Music likes: Queen,Progressive Metal, Rock, Dance music. Premier 6 piece 1986 drum kit in black. Please note that Supreme Queen are NOT in any way officially endorsed by Queen or Queen Productions. Please note that Nathan Mathers and Tom Bissel are no longer members of Supreme Queen and all photographs, images and videos are from past shows. Biographies and band member information will be updated with new band members soon.